Hello! It's time another Sparkle Creations Rubber Stamps Challenge! Thanks to all of you who played along last week! Each week we will post an all new challenge at this time (9 PM PST on Monday). For all the details, please visit the SCRS blog. 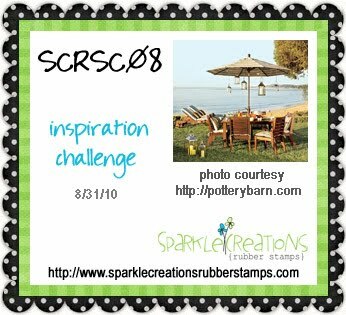 This week the challenge is an inspiration photo challenge. 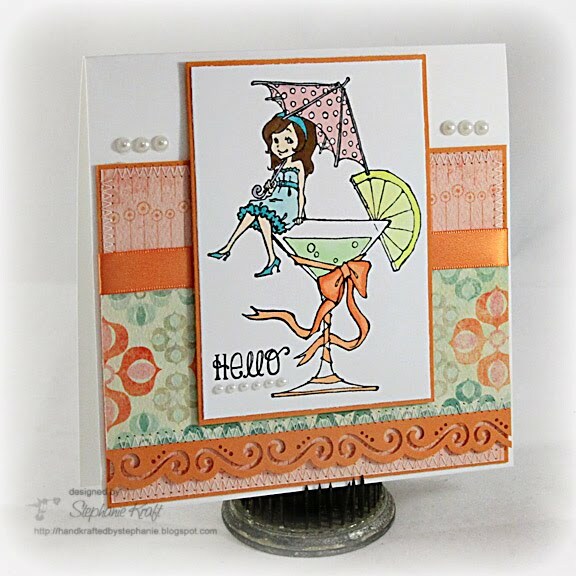 I didn't use the photo to pull my colors for my card, but rather I used the serene beach scene to create a card with Cocktail Emily. We had a nice couple of days in the pool over the weekend, and for once the weather was tolerable. No doubt it will heat up again soon, but in the meantime we are going to try to enjoy the reprieve while it lasts.. just like Emily is doing here! Accessories: Scroll & Lace border punch (EK Success), Markers (Copic), Pearls (Zva Creative), Ribbon (Papertrey Ink), Foam tape, Thread, Sewing machine. Such a darling card! I love all the orange! Cute! Love the color combination!